St. Vincent de Paul was “real,” in that many people can identify with his spiritual journey. Born into a peasant family living in southwestern France in 1581, he saw the priesthood as a way out of peasantry. Ordained at the age of 20, for 10 years he aimed no higher than a clerical life of ease. Then, in Paris in 1609, he came under the spiritual influence of Pierre (later Cardinal) de Bérulle. His work as chaplain to the Gondi family made him aware of the poverty — spiritual and material — of peasants; his role as chaplain general of the galleys in France made him aware of the terrible lot of the galley slaves. A great change came upon him, and he dedicated the rest of his life to the service of the poor. Thus, he did not start out with the highest motives, nor was he given an unmistakable sign from God, such as a dramatic “conversion experience.” Rather, he was open to God’s speaking to him through the people with whom he came in contact, and through his everyday experiences. That openness led him to deep holiness and a phenomenal ministry. Why was this name selected for the parish? Who first suggested it? 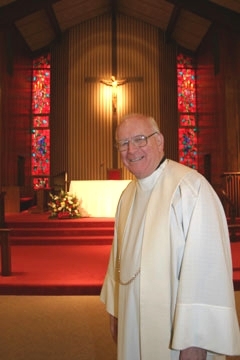 According to the founding Pastor, Father William T. McBride, when the Archdiocesan Sites and Boundaries Committee presented to the Archdiocesan Consultors the need for a new parish in Richboro, Bucks County, one of the consultors noted that, if there was to be a parish in a municipality called Richboro, it should be named for a patron of the poor. So Cardinal Krol decided that it would become St. Vincent de Paul Parish. How does the parish celebrate the Feast Day of St. Vincent de Paul on September 27th? Since St. Vincent’s feast day occurs during Ordinary Time, we transfer the feast to Sunday. The readings and prayers at each of the Masses that weekend are for the Feast of St. Vincent de Paul, not the Sunday of Ordinary Time. Evening Prayer or Morning Prayer of the Liturgy of Hours is sung within Mass by the entire congregation, led by two cantors; special participation booklets are prepared to make this possible. In addition, for the past several years on that Sunday afternoon, we have celebrated with the Feastival . This is a parish family picnic with food, music provided by our High School Youth Group, games for the youngsters, hay rides, karaoke, a balloon artist, games, two fire trucks, St. Vincent de Paul water (you have to be here … ) and more. And it is free. What special devotions are observed at the parish? We have prayer groups, holy hours, Night Prayer in honor of Our Lady, Divine Mercy hours, etc., but the [principal parish] devotion is Sunday Liturgy. Of which ministries are you most proud? Since Sunday Liturgy is the devotion we see as most important, the ministries that support Mass are emphasized: altar servers (students and adults), Extraordinary Ministers of Holy Communion, lectors, music ministry and ministers of hospitality. Given the mission of our patron, St. Vincent de Paul, we also give special consideration to service ministry: Angel Food, which prepares and delivers meals to parishioners in their times of need; Baby’s Corner, which collects infant clothing to be distributed to needy parents; Blood Drives; Christmas Food Baskets for two inner-city Philadelphia parishes; Meals for the Homeless, which go to St. John’s Hospice in Philadelphia; People to People Sundays (two a month) to collect staples for the local food bank; Respect Life Ministry and our Parish Conference of the Society of St. Vincent de Paul. What might those who are not parishioners be surprised to know? Our relationship with St. Charles Lwanga Parish in Uganda, and with the Diocese of Tezpur in India. We were introduced to each through the Mission Cooperative Plan. Father Joseph Serugo, A.J., spoke at all the Masses in June 1998. He is now assigned as the founding pastor of St. Charles Lwanga Parish, Bubaale, Uganda, in the Archdiocese of Mbarara, and sends us photographs and reports on the growth of his parish which are published in our Parish Newsletter. Father Xavier Paul spoke at all the Masses in July 1999, on behalf of the Diocese of Tezpur, India, after which we maintained contact with him and his diocese. The size and scope of our Parish Newsletter (which many parishes would call the Parish Bulletin). The Newsletter runs 14 pages, plus two pages of advertisements. Does the parish have any ethnic celebrations or traditions? To celebrate our cultural diversity and our unity, we have an annual Ethnic Dinner. In recent years, our cook volunteers have featured these ethnic foods: American, Croatian, German, Greek, Hungarian, Irish, Italian, Japanese, Philippine, Polish, and Spanish. Also, on Pentecost Sunday, at each of the Masses, the petitions of the Prayer of the Faithful are read in the different languages of parishioners. What interesting artifacts, architectural features and/or special works of art are in the church? The Father William T. McBride Memorial Window adorns the front of the Church and is illuminated at night. The window features our patron, St. Vincent de Paul, with his empty hands extended, and is meant to convey that all that St. Vincent received simply passed through his hands and went to the poor. The artist was the well-known Philadelphian, Robert F. McGovern. At the rear of the Church we have a stone, brought here from the Parish Church of St. Vincent de Paul in Paris, France. What amusing incidents are part of the parish’s history? While we laugh a lot, no specific amusing incidents of our parish history stand out. What occasions of or in the parish have been particularly poignant? Thanksgiving Day Mass is an especially poignant celebration for many parishioners. The Adult Choir provides the music, Morning Prayer of the Liturgy of the Hours is sung by the congregation within Mass, and there is a reception in the Church Hall immediately after Mass. Efforts are made to include parishioners who otherwise might be alone on Thanksgiving Day. What are among the most commonly asked questions about the parish? Do you accept donations of clothing (24 hours a day, seven days a week)? Do you pick up furniture? Directory Assistance seems unable to distinguish our parish from the Society of St. Vincent de Paul. What else would you like everyone to know the about the parish? Our parishioners are proud that “one of our own,” Rev. Mr. Christopher Cooke, will be ordained a priest on May 20 for service in the Archdiocese of Philadelphia. We are looking forward to his celebrating his First Mass here on Sunday, May 21st. We are preparing to build a Parish Center. This is being made possible by the Living Stones ... ... Building to Serve capital campaign that began in September 2004. It is phase one of a three-phase project. Name of School; Number of Students; Staffed by Which Religious Order; Number of Lay and Religious Staff? Our parish has a preschool with a current enrollment of 53 students. There are 10 lay teachers.Parishioners in grades 1 through 8 attend Catholic school in one of four neighboring parish schools: St. Andrew in Newtown; St. Bede in Holland; Nativity of Our Lord in Warminster, and Our Lady of Good Counsel in Southampton. St. Vincent de Paul Parish Convent. Present residents include one Sister, Servant of the Immaculate Heart of Mary (from the Scranton motherhouse) who is our director of religious education, and two Sisters of St. Joseph, who work in other apostolates.